This year, Maggie's oxen has become ill, and she cannot go trick-or-treating. Can you help by collecting treats for her? Note: This event was only available from 28 October 2008 until 11 November 2008. Begin by speaking to Maggie, located north of Rimmington. Use this map to find Maggie. Once there, speak to Maggie, she's wearing purple so she shouldn't be too hard to find. When you talk to Maggie about Halloween, she will tell you that her oxen, Babe, has become ill so she can't go trick or treating this year. So instead she will ask you to do it for her, how lovely. Anyway, she needs 6 Popcorn Balls, 5 Wrapped Candies, and 4 Chocolate Drops. If you ask her what constitutes as a costume, you will need at least two items that can be considered costume items. Ava's Accumulator Reward from the Animal Magnetism Quest. Bandos Equipment Obtain from either the God War Dungeon, or buy from another player. Bat Mask Possible reward from level 2 Treasure Trails. Black Skirt Bought from Thessalia's Clothing Shop in Varrock and dropped by the Dark Wizards south of Varrock. Blue Skirt Bought from Thessalia's Clothing Store in Varrock for 2gp. Blue Skirt ((t) or (g)) Obtained from level-1 Treasure Trails. Bobble Hat Obtained from the 2005 Christmas event. Bobble Scarf Obtained from the 2005 Christmas event. Bomber Cap Reward for completing the Enlightened Journey Quest. Bomber Jacket Reward for completing the Enlightened Journey Quest. Broomstick Obtained during Swept Away. 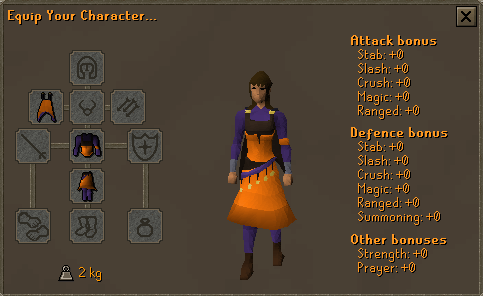 Brown Apron Bought from Varrock's Clothing Store. Builder's Boots Pickpocket the builder, 'No Fingers', to obtain the boots. He is located on the northern side of the Tower of Life. Builder's Shirt Speak with the builder, 'The Guns' and ask him for the shirt. He will reply that he has a shirt, but first he would like some cheap beer from Yanille. 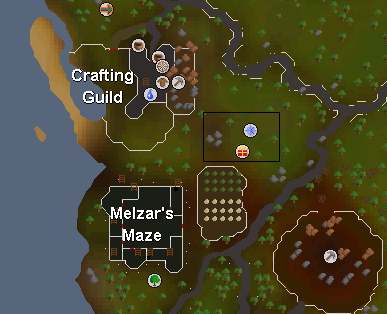 Head to Yanille, buy some beer, and return to 'The Guns'. Give him the beer and you shall be rewarded with a Builder's Shirt. Builder's Trousers The trousers can be found in some bushes around the east and southern sides of the Tower of Life. Search the bushes you see until you find some trousers. Bunny Ears Was only obtainable during the Easter 2003 Event. Camo Equipment Obtained from the Drill Demon Random Event. Cape Dropped by Highway Men. Cat Mask Possible reward from level 2 Treasure Trails. 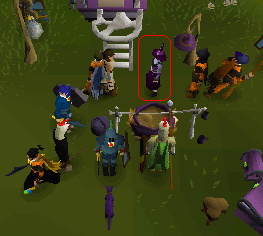 Chef's Hat Bought from the Fancy Dress Shop in southeast Varrock; dropped by Imps and Goblins. Chicken Equipment Obtained from the Easter 2007 Easter Bunny. Chocatrice Cape Reward from the 2008 Easter Event. Diving Apparatus Obtained during the Pirate Pete section of Recipe for Disaster. Eye Patch Fancy Clothing Shop in the members section of Varrock. Frog Mask Buy one from the Varrock Clothing Store with 1 Frog Token, received via random event. Gas Mask Take some Dwellberries to Alrena during Plague City Quest, or kill a Mourner on Arandar's Pass. Ghostly Equipment Obtained during the Ghostly Robes mini-quest. Gnome Goggles Possible reward from the Gnome Restaurant Activity. Gnome Scarf Possible reward from the Gnome Restaurant Activity. Grim Reaper Hood Reward for completing the 2007 Hallowe'en Event. Can be re-obtained from Diango in Draynor Village if you lose it. Guthix Mitre Possible reward from Treasure Trails. Guthix Stole Possible reward from Treasure Trails. H'ween Masks Dropped on October 31st, 2002, can be bought from players now. Infinity Equipment Bought From the Mage Training Arena shop. Jack Lantern Mask Obtained during the 2006 Halloween event. Jester Hat Obtained from the 2005 Christmas event. Jester Scarf Obtained from the 2005 Christmas event. Leather Gloves Found in crates and boxes, player-made with level 1 Crafting. Spawns just south of Edgeville Bank. Taken from the Tool Rack in the roped off area on the ground floor of the Varrock Museum. Lederhosen Equipment Obtained from the Freaky Forester Random Event. Lunar Equipment Obtained during the Lunar Diplomacy Quest. Mime Equipment Obtained by completing a Mime Stage Random Event. Moonclan Equipment Clothing shop On Lunar Isle, accessed after completion of the Lunar Diplomacy Quest. Mourner Boots, Cloak, & Gloves Kill a Mourner on the Arandar Pass during or after the Mourning's End Part 1. Mourner Top Kill a Mourner on the Arandar Pass during or after the Mourning's End Part 1, steal Tegid's soap from his Laundry Basket, then use the soap with the top that the Mourner dropped. Mourner Trousers Kill a Mourner on the Arandar Pass during or after the Mourning's End Part 1, then take what is dropped to Oronwen in Lletya with 2 Silks and 1 Fur. Naval Shirts & Slacks Reward from the Trouble Brewing Activity. Navy Slacks Reward from the Trouble Brewing Activity. Penguin Mask Possible reward from level 2 Treasure Trails. Pink Shirt Bought from Thessalia's Fine Clothes store in Varrock for 2gp. Pirate's Hat Possible reward from level 3 Treasure Trails. Pirate's Hook Bought for 800 Agility arena tickets from Pirate Jackie the Fruit outside the Brimhaven Agility Arena. Priest Gown (top & bottom) Bought from the Clothing Store in Varrock. Prince Leggings & Tunic Use frog tokens with the Varrock clothing shop. Princess Blouse & Skirt Use frog tokens with the Varrock clothing shop. Reindeer Hat Obtained by completing the 2006 Christmas Event. Santa Hat Originally obtained from the Christmas 2002 holiday drop; now you can only obtain one by trading another player. Saradomin Mitre Possible reward from Treasure Trails. Saradomin Stole Possible reward from Treasure Trails. Shade Bottom & Top A possible drop from the Shade random event. Sheep Mask Possible reward from level 2 Treasure Trails. Skeleton Equipment Obtained during the 2006 Halloween Event. Tribal Masks Kill a Broodoo Victim (level-60) wearing a Tribal Mask during the Tai Bwo Wannai Cleanup Activity. Tricorn Hat Reward from Trouble Brewing. Tri-Jester Hat Obtained from the 2005 Christmas event. Tri-Jester Scarf Obtained from the 2005 Christmas event. Warlock Equipment Obtained during the 2008 Halloween Event. 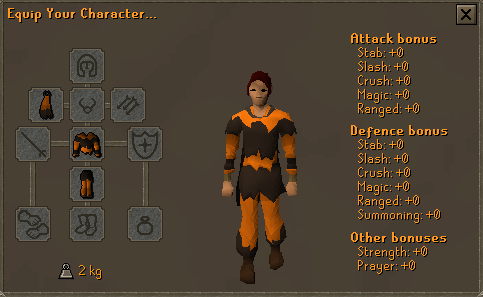 Witch Equipment Obtained during the 2008 Halloween Event. Wizard Hat (black, blue) Buy at Betty's Magic Emporium in Port Sarim. Also dropped by some monsters. Wizard Hat((g) or (t)) Obtained from level-1 Treasure Trails. Wizard Robe (black, blue) Dropped by Wizards. Wolf Mask Possible reward from level 2 Treasure Trails. Wooly Hat Obtained from the 2005 Christmas event. Wooly Scarf Obtained from the 2005 Christmas event. Zamorak Mitre Possible reward from Treasure Trails. Zamorak Stole Possible reward from Treasure Trails. Zombie Equipment Obtain from the Gravedigger Random Event. Now make sure before you leave the area with Maggie, you look into her cauldron. By doing this you get the 'Trick' Emote which is necessary for this event, or at least makes it easier. In addition you will gain any other Halloween emotes you have missed in the past (Zombie Hand, Scared). Now once you have your Costume items equipped, you can go to the following NPCs to do a bit of Trick-Or-Treating. Note: You will be turned away from the Wise Old Man. Once you have 6 Popcorn Balls, 5 Wrapped Candies and 4 Chocolate Drops; Go back to Maggie and give them to her to claim your rewards. For the Popcorn Balls you will receive a 'Witch Top' if your character is a female, if a male you will get a 'Warlock Top'. For the Wrapped Candies you will receive a 'Witch Cloak' if your character is a female, if a male you will get a 'Warlock Cloak'. For the Chocolate Drops you will receive a 'Witch Skirt' if your character is a female, if a male you will get 'Warlock Legs'.